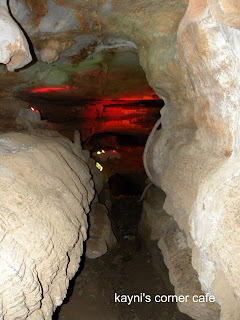 As we went deeper into the caverns, we met more characters inside and went through narrower pathways. If I'm not mistaken, the tour lasted from 45 minutes to an hour. When you do take a cavern tour, make sure to bring a sweater or jacket with you, as it gets cold inside. Also, wear comfortable clothing and shoes with a good grip because it could get slippery inside. 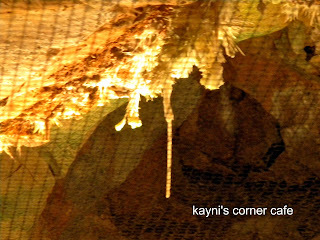 Our tour guide said that if water drops on you from the ceiling, it's called the cavern's kiss and it is considered lucky. I'm happy to say that I've been kissed by the cavern and that I feel lucky. How about a little geology lesson? 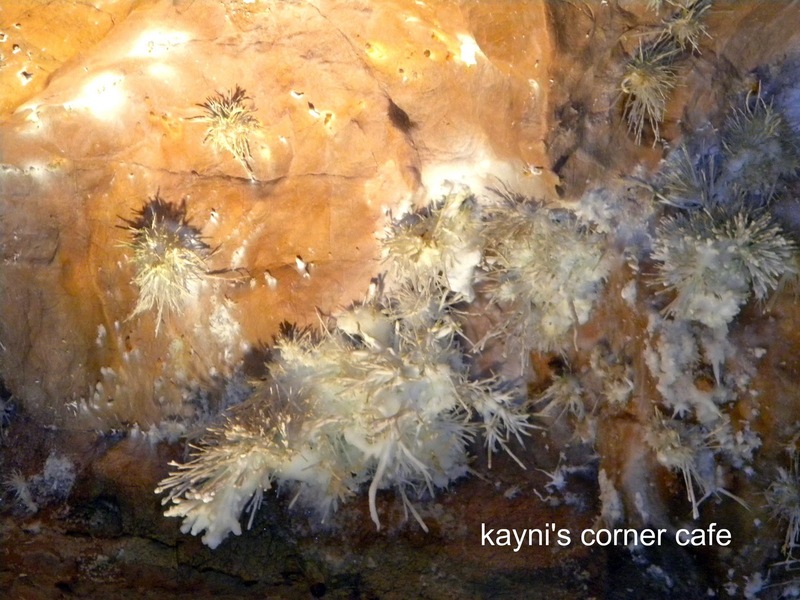 One of the reasons why I wanted to visit Skyline Caverns is because it is one of the few caverns in the world that houses the rare Anthodites. 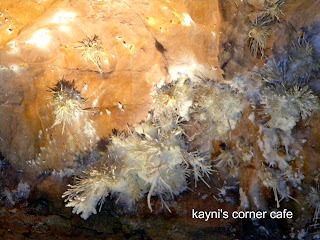 According to http://www.skylinecaverns.com/generalinfo.htm, Anthodites are also "called "Orchids of the Mineral Kingdom" and that they seem to defy gravity. 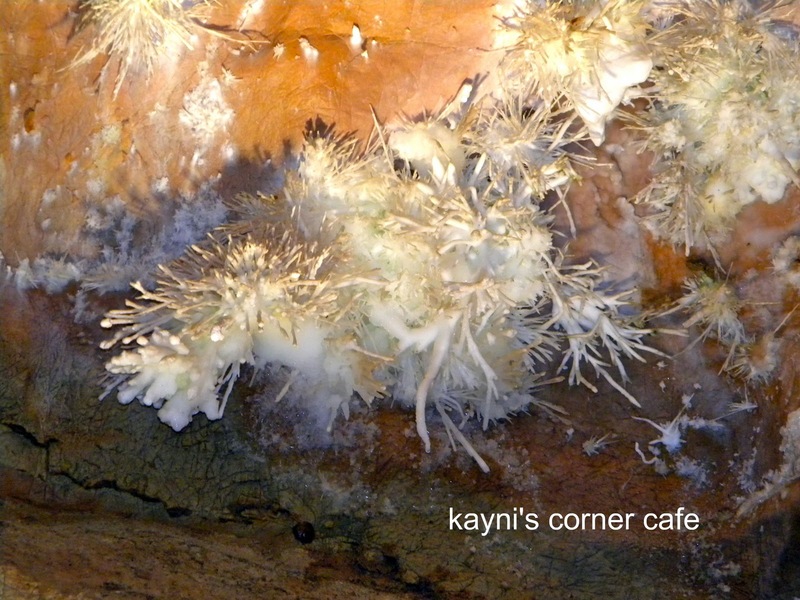 Their delicate white spikes spread in all directions, including upwards, from their position on the cave ceiling. Their growth rate is estimated to be only one inch every seven thousand years. The mystery of how they form only adds to the beauty of the Anthodites. 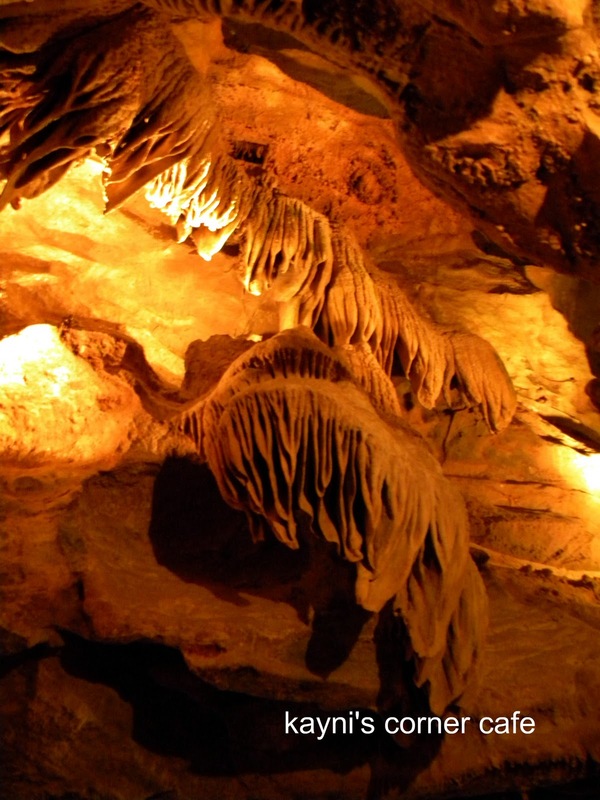 According to our tour guide, there are only a few caverns where you can find Anthodites, but it is only in the Skyline Caverns that Anthodites are on public display. Anthodites are known to thrive in a vacuum type environment, so since their discovery and the vacuum environment unsealed and disturbed, these Anthodites have stopped growing. Protected by a screen, this 18-inch formation is called "The Chandelier" and it is believed to be 126,000 years old. A peak into the underworld. The tour was fun and educational. This photo was taken as we climbed back into the outside world. - Skyline Caverns was discovered in 1973 by Dr. Walter S. Amos, a retired geologist. 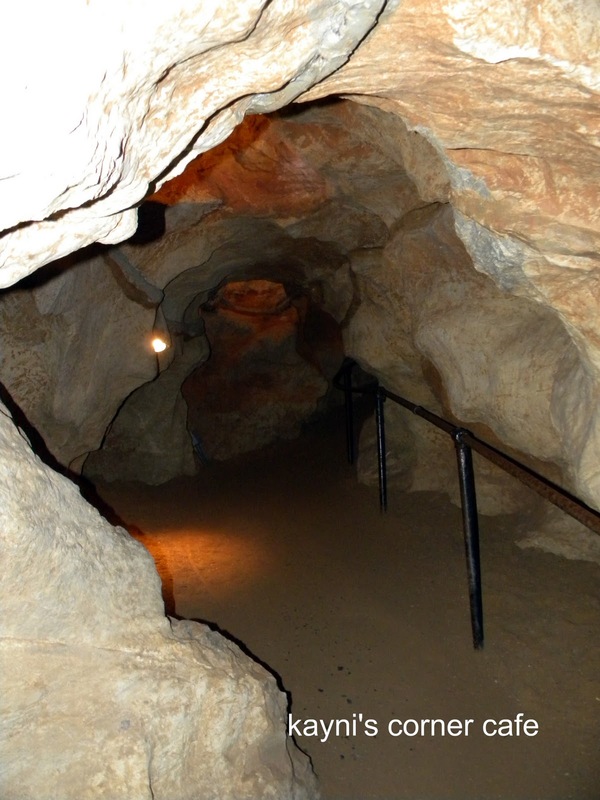 - It is home of the Valentine beetle which is believed to be only found in these caverns. According to our tour guide, the Valentine Beetle lacks optic nerves so it is completely blind. Seven beetles were found by scientists, but when they were exposed to outside light and temperatures, all seven beetles died; none has been found ever since. The Valentine Beetle is now believed to be extinct. The said beetles are now on exhibit at the Smithsonian in Washington, D.C.
- This cave maintains a temperature of 54 degrees all year long. 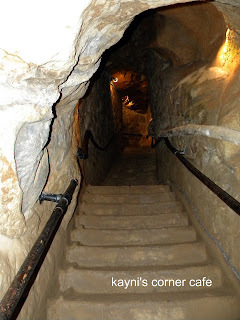 - The cave has tall and narrow tunnels also known as water tunnel or canyon with a roof, so imagine Grand Canyon only that it is underground. Goldfish surviving in one of the five Skyline Caverns' streams. - Information and facts that appear on this post are gathered from the Skyline Caverns tour I took on October 23, 2010. That looks fun but I am scared of deep inside places. :( Proud of you! if it isn't yet, this should be a place where schools take their students for field trip, there's plenty to learn. 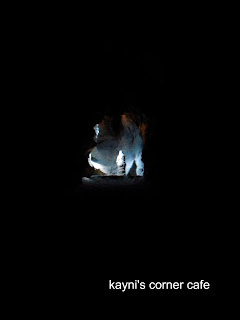 i like going to caves too. and what a resilient gold fish is that. wow! finally i was in the right high way to your blog! 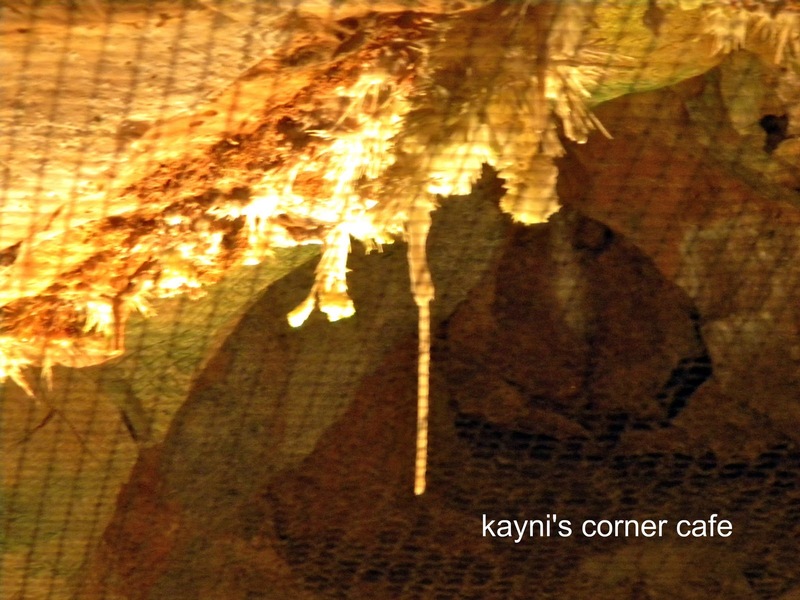 the first thing that i remember in this post in our dear sumaguing ang balangagan cave! whew missing home so much! Oh, wow! Thanks for the geology lesson! 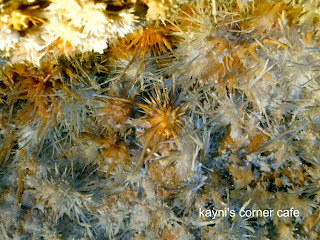 Anthodites look like cave corals! 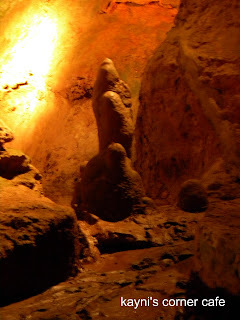 i remember reading from before that the stalagmites and stalactites in most caves stopped "growing" because of people touching them. 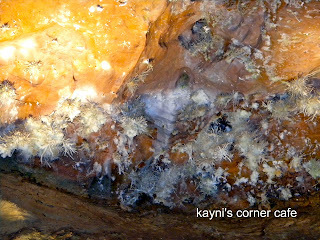 that's why it's discouraged inside sagada for visitors to touch the stones there. 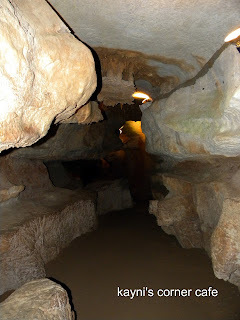 as for the anthodites, it's really interesting to know that being disturbed stopped their growth too..
we also visited a cave here and sad to say, the stones stopped growing already as it's so easy for the tourists to really touch them..